In an interview with the BBC during his recent visit to Britain, parliament speaker and Iraqiyya politician Usama al-Nujayfi once more uttered the controversial “federalism” term. Nujayfi reportedly said that the Sunnis of Iraq feel they are being treated as second class citizens and if no improvement takes place many will feel compelled to call for the establishment of “geographically-based federal regions”. Nujayfi’s comments constitute a careful modification of his previous reference to federalism (and even partition) as a possible option for the Sunnis of Iraq. In the first place, instead of indicating the possible establishment of a single, sectarian Sunni administrative unit, Nujayfi is foreshadowing calls for multiple federal regions in accordance with the constitutional provisions that enable governorates to transform themselves to standalone federal units or to merge with several governorates to form multi-governorate federal regions. Indeed, Nujayfi says he “favours” the establishment of such entities, which would mean a departure from the official Iraqiyya line which has tended to be sceptical to the establishment of additional federal entities in Iraq, but at the same time, especially more recently, surprisingly prepared to extend concessions to the one existing federal entity (Kurdistan). Secondly, Nujayfi this time emphasises Sunni commitment to the territorial integrity of the Iraqi state as a whole, although it should be noted that his whole approach of talking on behalf of the Sunnis signifies a political mindset that nonetheless remains focused on sectarian subdivisions. Still, on the whole, Nujayfi’s comments mainly add to the string of examples of federalism used as a threat by elite politicians rather than necessarily reflecting any strong popular commitment to the creation of such entities. To some extent, this reflects the exasperation of Iraqiyya leaders who have been unable to get the concessions they are seeking from Prime Minister Nuri al-Maliki, partly thanks to their own haplessness. In this perspective, federalism comes across as a tool of opportunistic politicians, as also seen in some of the recent calls for federal regions by governorate council members in areas that do not enjoy any genuine tradition for making such demands, including Wasit. Unfortunately, the overly permissive law on the establishment of federal regions from 2006 enables such opportunism, since a mere third of governorate council members can call for a referendum on the creation of a federal region. This in turn can lead to useless referendums for initiatives that in reality do not enjoy support anywhere close to the levels needed to win a referendum. Nonetheless, any growth of such calls for federal regions in the Sunni-majority governorates would create an interesting dilemma at the level of the central government. So far, Maliki has deliberately resisted initiatives for federal referendums initiated by politicians from his own State of Law coalition in several governorates south of Baghdad and most prominently Basra, which does have a consistent pro-federal tradition dating back to 2003. The main reason he has been able to contain these initiatives (and, indeed, unconstitutionally obstruct them) is precisely the fact that they originate from his own partisans. A multiplication of similar calls from the Sunni-majority governorates would be more difficult to resist, and in turn could create domino effects in the Shiite areas that would altogether threaten Maliki’s ambition as a nominally nationalist and centralist strongman for Iraq. At the same time, it is interesting that the calls for federalism come at a time with persistent reports about a deepening of the subdivisions within Iraqiyya, with precisely Nujayfi reported as one possible alternative point of gravity to Ayad Allawi, the leader of Iraqiyya and his Wifaq movement. Whether the federalism threat is just a negotiating card in a strategy that ultimately aims at negotiations between Maliki and parts of Iraqiyya remains to be seen. During the past few decades, few words in the vocabulary of politics have been more angst-inducing among Arab leaders than “federalism”. Associated with division, colonialism, Israel and other undesirables, “federalism” has long been approached with suspicion by the entire Arab political class. Instead, “administrative decentralisation” – by which was often meant that municipalities would enjoy complete supremacy in such matters as the collection of dustbins – remained the preferred term for contemplating any possible cession of power from the centre. In this kind of perspective, developments in Iraq during the first part of 2011 have been somewhat remarkable. As is well-known, Iraq’s constitution adopted in 2005 includes flexible provisions for the creation of new, future federal entities alongside the one federal region explicitly recognised in the charter itself – Kurdistan. However, it was generally thought that those provisions largely reflected the wishes of a tiny group of Kurdish (KDP/PUK) and Shiite (SCIRI) politicians who with American help managed to sideline the rest of the Iraqi political establishment: For a long time, real interest in the creation of new federal regions seemed confined to the far south in Basra, whereas pro-federal currents elsewhere remained at the level of rumours. But more recently, even politicians of the secular Iraqiyya alliance have increasingly become associated with various political demands that are federalist, or federalist in everything but the name (as seen for example in the demand by the local council in Anbar to cut separate gas deals with foreign companies). In other words, it seemed as if Iraqiyya was turning its back on everything it had said previously about the virtues of a strong, centralised government. However, this week, the top leadership in both the secular Iraqiyya and the Shiite Islamist State of Law have brought a measure of clarity to the debate. Ayyad Allawi, head of the Iraqiyya alliance, declared that the party is against the creation of more federal entities, while at the same time calling for “greater powers to the governorates on a decentralisation basis”. 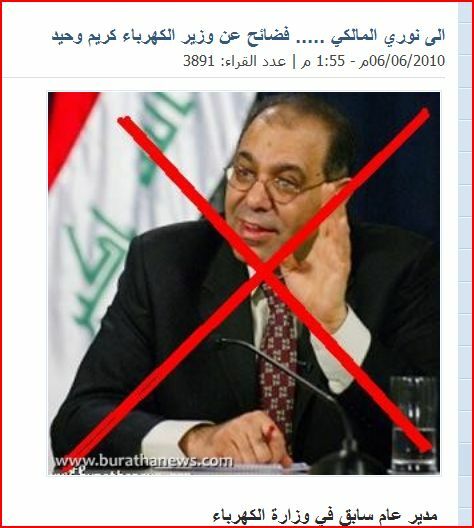 Another Iraqiyya leader, Salih al-Mutlak, expressed the view that no governorate should have more powers than others. Coincidentally, the remarks by the Iraqiyya leadership followed similar sceptical comments by Prime Minister Nuri al-Maliki of State of Law, who has recently seen a string of potential federalist challengers in his “own”, mostly Shiite fiefdoms, including Basra, Wasit and most recently Babel. (At least some of these challengers involve politicians from Maliki’s own faction.) All of a sudden, it looked as if we were back at the well-known configuration of positions known from the past, with Sunni-secularist rejection of federalism and considerable Shiite Islamist opposition to pro-federal tendencies within their own ranks (i.e. by ISCI and some local politicians). Those latest comments and the reactions to them illustrate the continuing stalemate on one of the more fundamental issues in Iraqi constitutional law. Kurdish president Masud Barzani seemed angry with Maliki for his lack of interest in federal regions outside Kurdistan, despite the constitutional provisions that exist. For their part, some of the participants at the Iraqiyya meeting seemed to condemn federalism as a principle altogether (rather than new federal regions), to the point where media stories about Salih al-Mutlak supposedly rejecting the federal status of KRG began circulating. In this way the whole debate gets polarised: The KRG is actively abetting federal projects outside its own territory and is claiming powers that are not even in the constitution, whereas some Iraqiyya leaders give the Kurds reason to doubt that the federalism granted to them by the constitution is indeed guaranteed. Another complicating factor relates to the discrepancies between the constitution and the provincial powers law of 2008. When Iraqiyya is claiming “more power for the governorates”, do they mean more power than granted to them by the provincial powers law of 2008, or just a proper implementation of that law? In article 115 of the constitution federal regions and governorates enjoy exactly the same residual powers and are arguably created almost equal; in the provincial powers law of 2008 (and the draft oil and gas law) a greater degree of administrative subordination to Baghdad is clearly envisaged. Many suspect that local politicians in Iraq are contemplating the creation of federal regions for the sake of getting bigger budget shares. Some apparently believe they can ask for anything in the name of the existing governorates as long as they do not utter that “divisive” F word! However, the current practice of allocating a certain share of the budget to the sole federal region (Kurdistan) and exempting it from contributing to other central government expenses than defence and the foreign ministry has no constitutional basis as such, and would become a matter of debate if more federal regions were created. 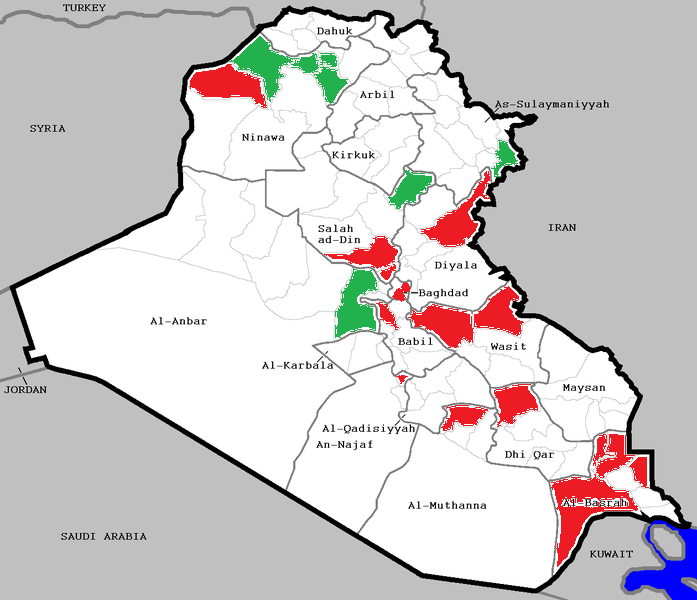 The bottom line is that unless there is constitutional revision to clear up the distinction between a federal region and a governorate, the discussion about the Iraqi state structure is likely to remain detached from reality and will serve as yet another distraction from the more pressing issue of consolidating a government that can provide services and infrastructure for the Iraqi population. The last couple of days have seen an outpouring of cheerful comments by optimistic observers of the Iraqi election campaign. The high number of candidate posters, it is argued, is testament to a vibrant democracy! Perhaps the assessment of the Iraqi political process would become more realistic if observers went beyond counting the posters and started actually analysing what is written on them. 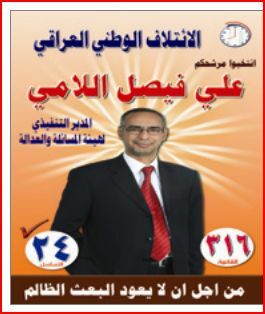 And a good place to start is of course the wonderful placard for candidate number 24 on list 316 (Iraqi National Alliance) in Baghdad, Ali Faysal al-Lami. 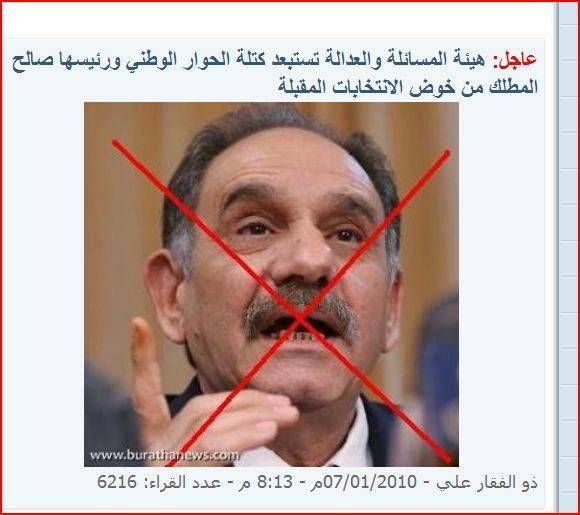 Immediately following Lami’s name, the principal item of his resume is indicated: “Executive director of the accountability and justice commission”, also known as Iraq’s de-Baathification board. At the bottom of the poster is a slogan, “For the sake of preventing the return of the oppressive Baath”. Lami’s poster highlights the way in which the legacy of the de-Baathification process is deliberately being inserted in the Iraqi election campaign, effectively overshadowing many more important issues in Iraqi politics. And even at this late stage, Lami and his allies have the audacity to shamelessly employ the accountability and justice board – which in theory was supposed to be a politically neutral institution – to keep up the pressure as far as de-Baathification is concerned, all the way to election day it seems. On the last day of February, Candidate al-Lami, this time wearing his hat as de-Baathification director, dramatically announced that his commission would publish the evidence against the excluded candidates “at some point before the 7 March elections”, suggesting a crescendo towards a grand anti-Baathist finale on the eve of the poll. Also the supposedly more neutral state bureaucracy is succumbing to pressure by Lami and his allies. Judge Abd al-Sattar al-Birqadar, the spokesman of the higher judicial council, recently dismissed as “unrealistic” the attempt by Salih al-Mutlak to mount a legal challenge against the de-Baathification board, claiming that the appeals board constituted by parliament was the highest authority in the matter. What he failed to mention – and what the higher judicial council has so far not responded to in a judicial way– is the problem that neither the de-Baathification board nor the appeals court constituted to deal with its proceedings has any authority to rule on exclusions related to article 7 of the Iraqi constitution. The IHEC and UNAMI seem more focused on how to replace the banned candidates instead of considering the far more fundamental problem concerning the implementation of article 7; the Americans, for their part, now appear to be primarily concerned that it is very important that the losers of the elections behave in a polite manner, i.e. that they go quietly. The outcome of all this is elections whose legitimacy is in doubt even before the first votes have been cast. The secular and nationalist forces keep asking critical questions about the process (including the much-disputed printing of more than 7 million ballot papers in excess of what is needed) and have signalled that they may boycott the political process in the next parliament if the election is fraudulent. Isn’t it reductionist to focus so exclusively on the de-Baathification process? Yes and no. Often overlooked in the west is the often Delphic character of the political discourse of Iraqi electoral candidates, even in this new age of democracy. It is for example slightly disconcerting that the number one candidate of State of Law in Nasiriyya in a recent, much profiled interview with an American journalist was unable to proffer any substantial description of his party’s political programme whatsoever. Other agendas that transpire in the election debate are disconnected from national politics altogether. Why don’t we take a look at the activities of the counterpart of Lami in Basra, INA’s number 24 there, Wathib al-Amud. He recently began campaigning for the creation of two new governorates to be parcelled out from Basra itself: Qurna and Mudayna (or Madina; some locals reportedly object to the diminutive form). 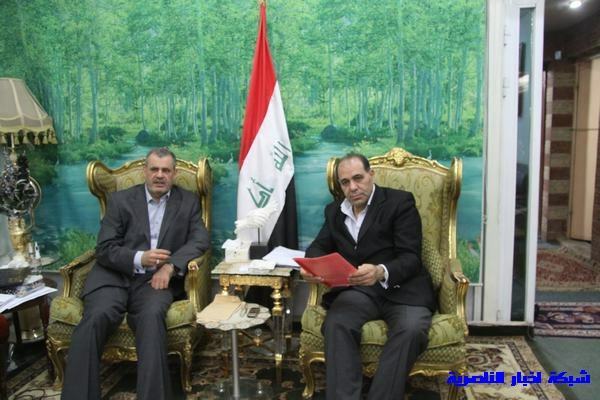 Candidate al-Amud says the two northernmost portions of the governorate do not receive a fair share of the Basra budget. More than 750,000 people live here, he says, which is more than both Dahuk and Muthanna (which in turn enjoy governorate status). If 100,000 signatures are collected, the Iraqi parliament will have to grant them governorate status! It doesn’t matter one iota, it seems, that no such procedure for sub-governorate secession actually exists anywhere in the constitution (the competing project of a federal region for Basra, which is currently on the backburner after its proponents instead decided to fight for extra revenue in the budget, at least has a legal basis). No, Amud, who is propagating a scheme that first appeared around December 2008 in the sub-governorate council of the oil-rich Qurna area, is making it all up and no one seems to care. Much like the situation at the national level, the Iraqi “democratic” process in Basra is full of fantasy and unencumbered by the tiresome inhibitions of law and due process. Some observers will no doubt see the Amud phenomen as yet another indicator of the prospering character of Iraq’s new democracy. “Pork barrel” may perhaps come across as supremely insensitive in the Iraqi context and yet this very American expression may be the best way of explaining the political compromise that facilitated the passage of the 2010 budget in the Iraqi parliament yesterday.The key to understanding at least some of the underlying dynamic here is hidden in article 43 of the new budget law, which specifies special rates of added income for a number of Iraqi governorates according to their economic structure… Full story here.